The Eight Worst Episodes of XENA: WARRIOR PRINCESS (Post 2 of 2) | THAT'S ENTERTAINMENT! Welcome to another Xena Thursday! Following our 22-week stint covering my 60 favorite episodes of Xena: Warrior Princess, today we’re continuing with four more of my eight least favorite episodes of the series. If you’re unfamiliar with the show, it was a spin-off of Hercules: The Legendary Journeys and aired in first-run syndication from 1995 to 2001. Taking place primarily in Ancient Greece, the show focused on Xena (Lucy Lawless), a reformed warlord seeking redemption for her evil past by helping others. She traveled with her best friend, Gabrielle (Renée O’Connor), an aspiring bard and the chronicler of Xena’s adventures. I have chosen the worst eight of the 134 produced episodes. Of course, these are all subjective. For those who are familiar with the series, I hope my points-of-view will prove fascinating and perhaps inspire you to reexamine your favorite, or perhaps least favorite, episodes. For those who are unfamiliar with the series, this list might spark your interest and give you some places to start. Even though these are MY least favorite episodes, since the series did so many different things over the 134 episodes, Xena is the type of show that requires multiple viewings to be properly assessed. The ranking is subjective. (Some of these episodes may be another fan’s all-time favorite!) So, newbies, if a particular story strikes your fancy, I encourage you to give it a try! In fact, contact me and I will be able to hook you up. When Gabrielle is knocked unconscious into the sea, a merman convinces her that she is his wife and the mother of three. Ask most fans what their least favorite episode of Xena: Warrior Princess is and the majority will probably cite “Married With Fishsticks.” Okay, Tapert, we get it: Lawless is on maternity leave and can only be used for half-a-day. But how in the world do you concoct a plot for this episode that, though in keeping with the show’s brilliant use of camp and kitsch, lacks heart, honesty, and sense. Unlike other Xena-lite episodes with cohesive stories and some fine comedic and dramatic moments (“King Of Assassins” and “The Play’s The Thing” both come to mind), this episode is simply not entertaining because it’s too ridiculous. It’s bad television. Bad, embarrassing television. However, it’s not my absolute least favorite episode. You know why? Because, although the episode fails, it’s not taking itself seriously like the two Season Five China episodes that we covered last week. “Married With Fishsticks” is often the scapegoat for angry fans looking to pinpoint blame on a sole representative of the disappointing fifth season. The truth is, though this episode is exactly what a Xena episode should NOT be, the real guilt for the season should be focused on the dramas that try too hard to be of a high caliber and end up failing miserably. This piece of you-know-what didn’t have very far to fall. New fans, stay away. Established fans, as usual, proceed with caution. Xena and Gabrielle travel to the Amazon village to make Eve an Amazon princess and discover that it’s up to them to prevent unnecessary bloodshed in a vengeful war. This episode was an excuse for the producers to use recut footage from their unsold television pilot called Amazon High. To make it fit as a Xena episode, the producers concocted a cockamamie story about Xena needing a special stick to teach the Amazons lessons from their ancestors, and thus preventing a war. (I rolled my eyes just typing that.) It’s not that the “flashbacks” are bad, it’s just that it’s clearly NOT a Xena episode, and necessitations from Lawless’s pregnancy aside, there’s no legitimate reason for this episode. 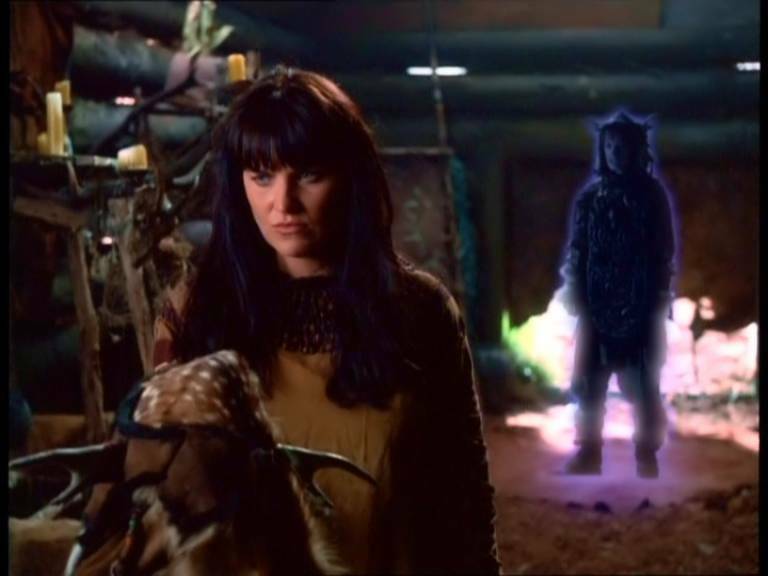 The grief over Yakut and Amarice’s deaths are handled with simultaneous melodrama and triviality — serving little purpose other than allowing Yakut to help Xena get the mystic stick. (It’s called the “utma dagger.”) Eve is made an Amazon princess, and although that could lead to some interesting future stories, with hindsight we know that this is practically a wasted development. While “Kindred Spirits,” the follow-up to this episode, has garnered mixed reactions (largely due to its self-dichotomous tone), there were some interesting issues addressed. I wish I could say the same for this episode, but I can’t. The producers found a cheap way to produce a quick episode. There’s little Xena and the Xena bits we DO get are half-baked. Essentially pointless. Unlike the two above episodes, “Last Of The Centaurs” features an honestly rendered story with a premise that looks exceptionally well-developed on paper. Unfortunately, the execution of the episode leaves a lot of be desired. I suppose my biggest qualm regards the futileness of the episode coupled with its inherent LACK of entertainment. (I can forgive a futile episode like “Send In The Clones,” because it happens to be entertaining.) It is unnecessary for the series to revisit Borias, whom I felt got closure in the “Past Imperfect” flashbacks. There were other parts of Xena’s past that had yet to be explored, so it seems almost like overkill to bring him back now. But, it IS always nice to see him. Similarly, it’s always nice to see Ephiny, but her presence is almost counterintuitive to the episode — hanging around like a ghost and acting very out-of-character. It’s cringeworthy. One thing I liked about the episode, however, was the apparent role reversal between Xena and Gab, but the script didn’t follow through enough with that to really make it work. Additionally, Lawless looks and acts exhausted, making it difficult to really buy into her performance. Solid premise, mediocre script, disappointing execution. A waste of an episode — especially one so close to the end. The discovery of an ancient scroll that indicates Xena married Ares leads to a highly charged press briefing attended by the modern-day reincarnations of Xena, Ares, Gabrielle and Joxer. Again, the concept of finding a “lost scroll” that takes place during the “Golden Age” of Xena seems like a great idea for the episode that takes place right before the finale. It’s also a great chance to bring back Ares and the dearly departed Joxer. But the whole premise of the installment, essentially an excuse for the writers to explain EXACTLY how Gabrielle got out of the lava pit in between “Sacrifice (2)” and “A Family Affair,” is one big example of revisionist history. My biggest objection to the episode is that, although some fans were dissatisfied with the disjointed explanation given in “A Family Affair,” that episode DID offer one and I was, frankly, satisfied. (Read more about that here.) The show’s attempts to offer a concrete explanation just turn into one big mess. Let it go — that was two years ago! Furthermore, though some Xena/Ares fans might have been pleased to see the two headed to the altar, I can’t imagine that they were satisfied with the representation their relationship got here. (It was great to use Ares — but why not explain how Xena trapped him in the tomb, which we learned about in Season Two’s “The Xena Scrolls.”) The icing on this awful cake is the inclusion of the characters from “Deja Vu All Over Again,” a mediocre episode that didn’t need revisiting. A real waste — especially given the final returns of both Ares and Joxer (and Meg). I hate being so negative — but I’m just telling it like it is! And eight awful episodes out of 134 is a pretty good record. Come back next Thursday for another Xena post! And tune in tomorrow for our last Vivien Leigh Film Friday post! Pingback: THE XENA SCROLLS: An Opinionated Episode Guide (515 & 516) | THAT'S ENTERTAINMENT! Pingback: THE XENA SCROLLS: An Opinionated Episode Guide (617 & 618) | THAT'S ENTERTAINMENT! Pingback: THE XENA SCROLLS: An Opinionated Episode Guide (619 & 620) | THAT'S ENTERTAINMENT! I LOVE LOVE Soul Possession. Shocked at the dislike for it. The whole new scroll thing pretty explains away any problems one may have with any supposed contradictions. You can choose which version to believe (Ares or Dahak saving Gabrielle ; or maybe Dahak saved Gabrielle through Ares, or made him think so ; or maybe Ares made Gabrielle think that in a ‘remember nothing’ situation). It’s a wonderful celebration of everything I love about Xena, funny and serious. It feels like a classic episode, connected to the first four seasons, unlike the disconnected feel of 5 & 6. Hi, Tate! Thanks for reading and commenting. My biggest concern with “Soul Possession” isn’t that it’s contradictory, but that it’s unnecessary — I didn’t need further clarification regarding what happened to Gabrielle/Hope in the lava pit because “A Family Affair” gave the answers (even if it didn’t show them). Also, I disagree that it feels classic and connected to the first four seasons — even though I assume that this was indeed its intention — because it stylistically embraces tenets from the last two years (Ares as equal parts love interest and villain, reincarnation via the modern-day players, the heavy-handed soulmates motif, etc. ), at the expense of how the series *actually* existed during the era it decided to narratively revisit. But, different strokes for different folks!